I will describe the inside of the “black box” (actually light blue in this picture) where the build, package and deploy are done for an Oracle JET application. The outline of the approach: a Docker Container is started in response to the code commit. This container contains all tooling that is required to perform the necessary actions including the scripts to actually run those actions. When the application has been deployed (or the resulting package is stored in an artifact repository) the container can be stopped. This approach is very clean – intermediate products that are created during the build process simply vanish along wih the container. A fresh container is started for the next iteration. 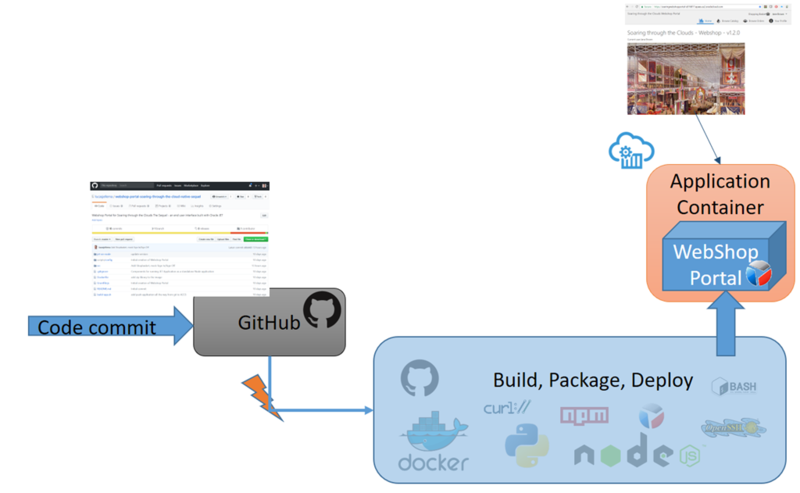 Note: the end to end build and deploy flow takes about 2 to 3 minutes on my environment. That obviously would be horrible for a simple developer round trip, but is actually quite acceptable for this type of ‘formal’ release to the shared cloud environment. 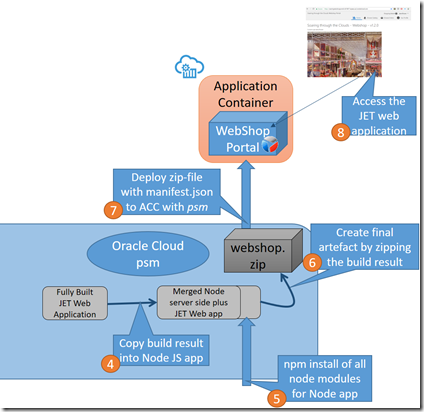 This approach and this article are heavily inspired by this article (Deploy your apps to Oracle Cloud using PaaS Service Manager CLI on Docker) on Medium by Abhishek Gupta (who writes many very valuable articles, primarily around microservices and Oracle PaaS services such as Application Container Cloud). Note: this article focuses on final deployment of the JET application to Application Container Cloud. It would however be quite simple to modify (in fact to simplify)the build container to not deploy the final ZIP file to Application Container Cloud, but instead push the file to an artifact repository or deploy to some other type of runtime platform. It would not be very hard to take the ZIP file and create a fresh Docker Container with that file that can be deployed on Kubernetes Cluster or any Docker runtime such as Oracle Container Cloud. 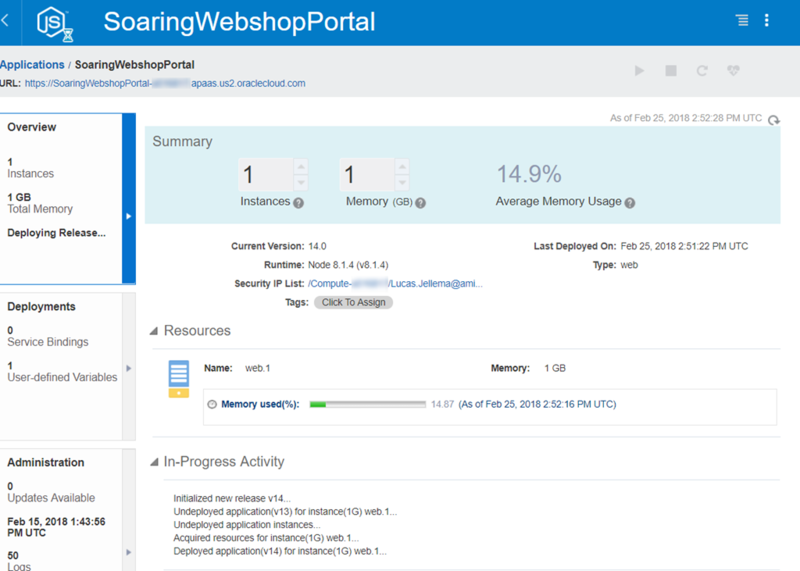 The sources – including a sample JET Application – are in this GitHub repo: https://github.com/lucasjellema/webshop-portal-soaring-through-the-cloud-native-sequel . The first step is the composition of the Docker Container. For this step, I have made good use of Abhishek’s article and the dockerfile he proposes in that article. 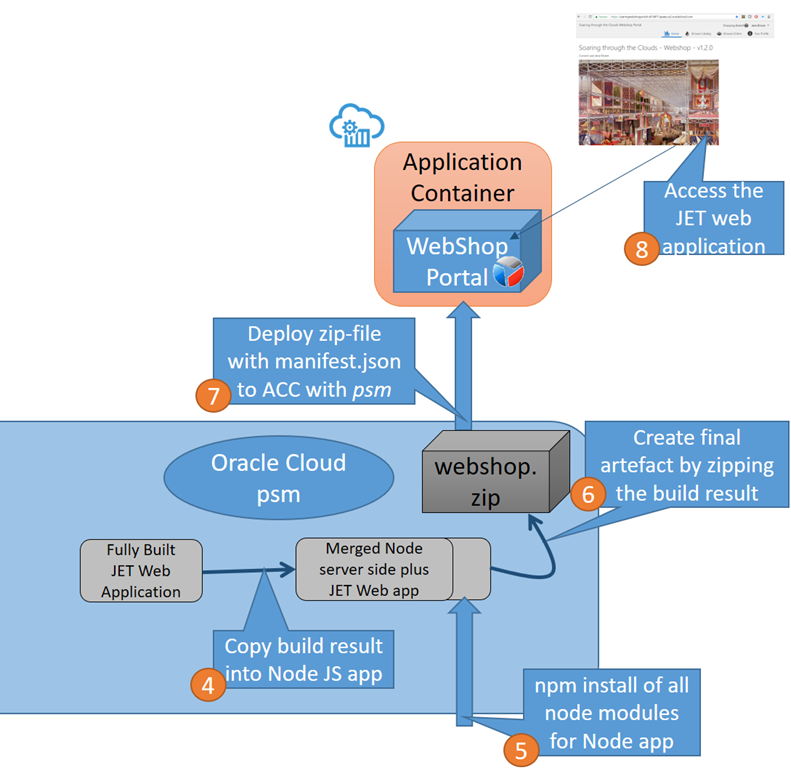 I complemented Abhishek’s Dockerfiles with the tooling required for building Oracle JET applications. Note: it is fun to bake Docker Container Images completely through a Docker file – and it is certainly convenient to share the instructions for creating a Docker Container image in the form of a Docker file. However, when the steps are complex to automated through a Docker file, there is a simple alternative: build as much of the container as you can through a Docker file. Then run the container and complete it through manual steps. Finally, when the container does what you need it to do, you can commit the state of the container as your reusable container image. And perhaps at this point, you can try to extend the Docker file with some of the manual steps, if you feel that maintaining the image will be a frequently recurring task. 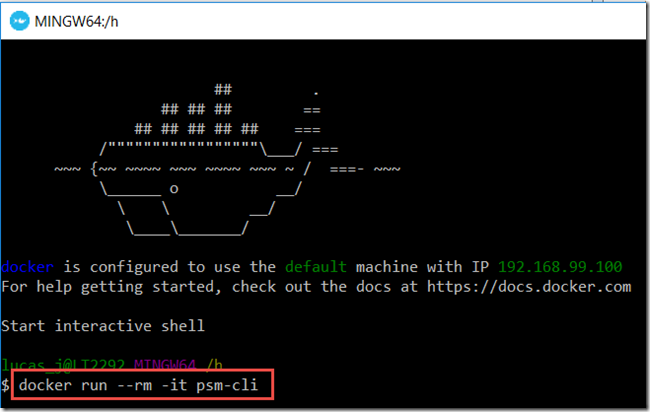 docker build –build-arg USERNAME=”your ACC cloud username” –build-arg PASSWORD=”the ACC cloud password” –build-arg IDENTITY_DOMAIN=”your identity domain” –build-arg PSM_REGION=”us” –build-arg PSM_OUTPUT=”json” -t psm-cli . assuming that this command is run in the directory where the docker file is located. 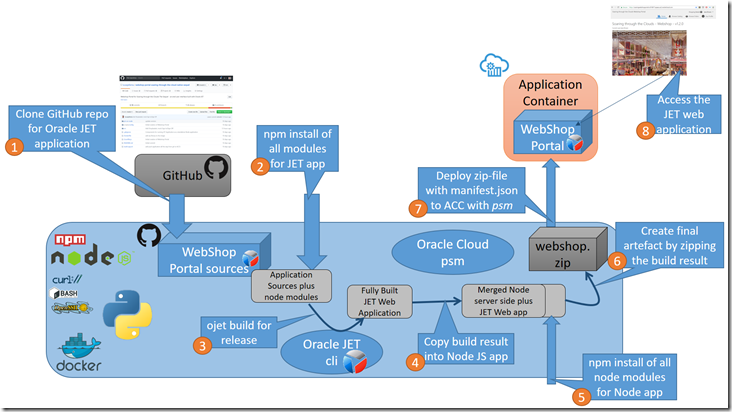 When developing a JET (4.x) application, we typically use the Oracle JET CLI – the command line tool that helps us to quickstart a new application, create composite components, serve the application locally as we are developing it to a browser with instant update of any file changes. The JET CLI is also used to build the application for release. 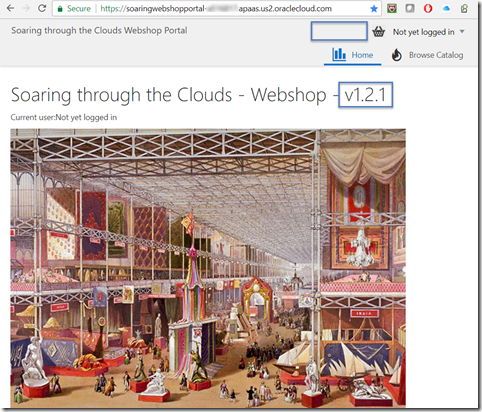 The result of this step is the complete set of files needed to run the JET application in the browser. In order to actually offer the JET application to end users, it has to be served from a ‘web serving’ platform component – such as nginx or a backend in Python, Java or Node. 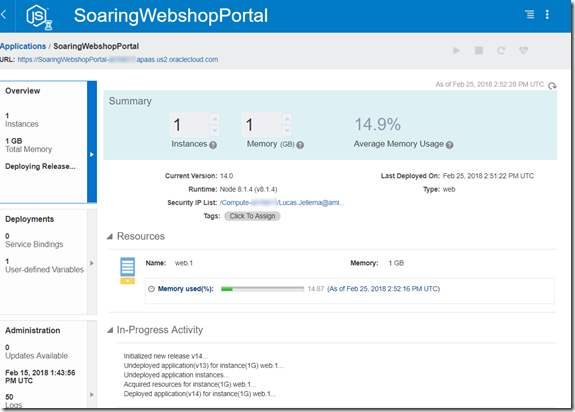 Frequently, the JET application will require some server side facilities that the backend that serves the static JET application resources can also provide. For that reason, I select a JET serving backend that I can easily leverage for these serverside facilities; for me, this is currently Node. 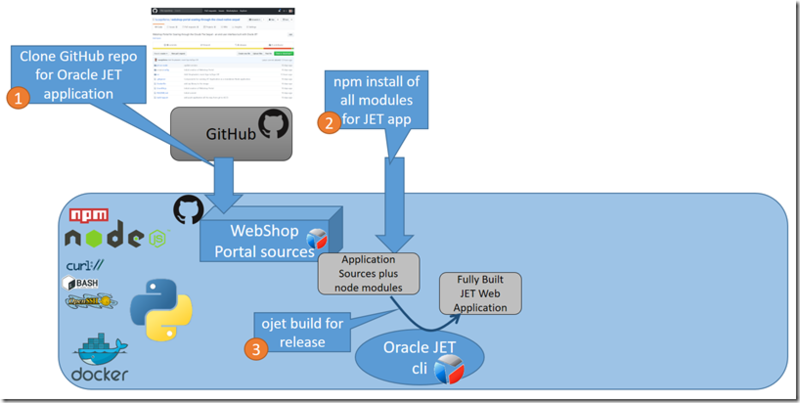 In order to create a self running JET application for the JET application built in the pipeline discussed in this article, I have added a simple Node & Express backend. I have used npm to create a new Node application (npm init jet-on-node). I have next created directory bin and the file www. This file is main entrypoint into the node application that serves the JET application; it delegates most work to module app that is loaded from file app.js in the root of this Node application, path /jet-on-node . 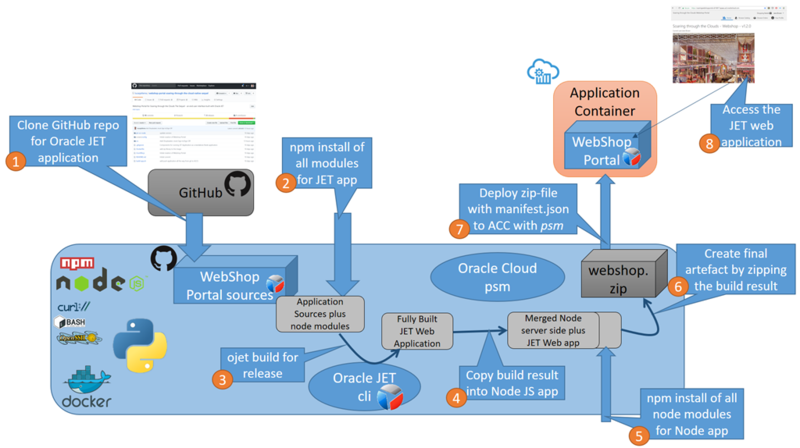 The dependencies for the jet-on-node application are defined in package.json during the build process of the final application, we will use “npm install” to add the server side required node modules. At this point, we have extended our code base with a simple landing platform for the JET application that can serve the application at runtime. 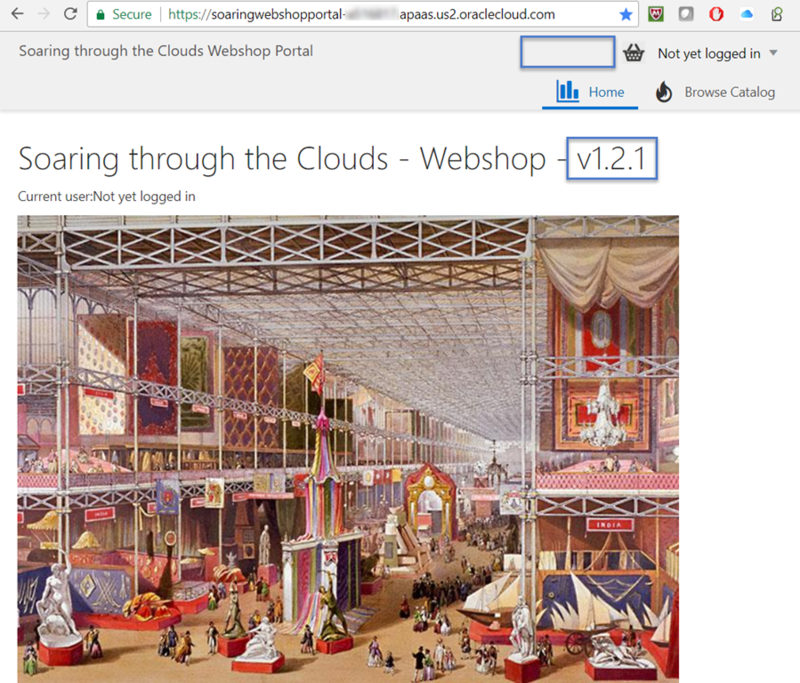 All that remains is to take all content under the /web directory and copy it to the jet-on-node/public folder. Then we can run the application using “npm start” in directory jet-on-node. 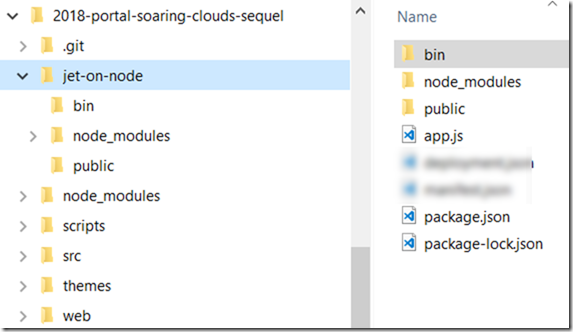 This will execute the start script in file package.json – which is defined as “node ./bin/www”. 6. Create a single zip file for all artifacts in the /jet-node directory – that includes both the JET application and its server side backend Node application. This zip-file is the release artifact for the JET application. As such, it can be pushed to an artifact repository or deployed to some other platform. 7. 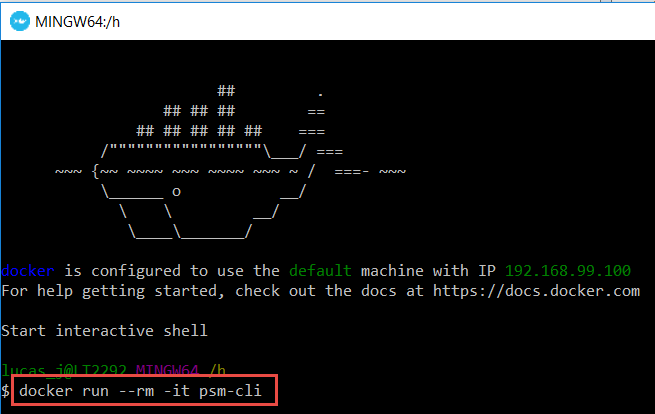 Engage psm command line interface (Oracle PaaS Service Manager CLI) to perform deployment of the zip file to the Application Container Cloud for which psm already as configured during the creation of the build container. 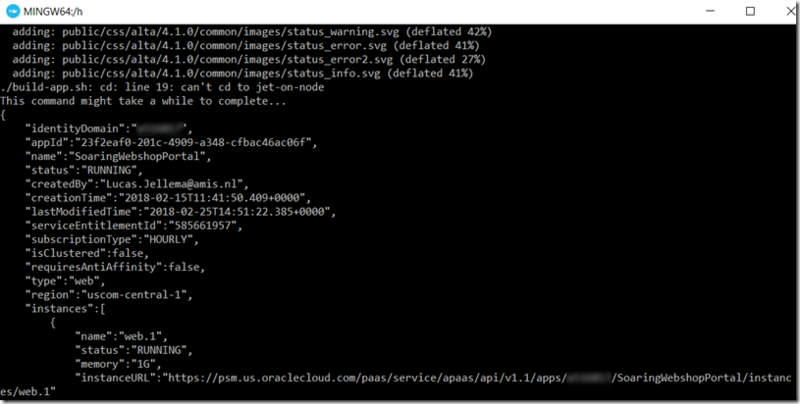 Note: the files manifest.json and deployment.json in the root of jet-on-node provide instructions to PSM and Application Container Cloud regarding the run time settings for this application – including the runtime version of Node, the command for starting the application, the runtime memory per instance and the number of instances as well as the values of environment variables to be passed to the application. The shell-script build-app.sh (you may have to explicitly make this script executable, using “chmod u+x build-app.sh”) performs the steps described above (although perhaps not in the optimal way – feel free to fine tune and improve and let me know about it). 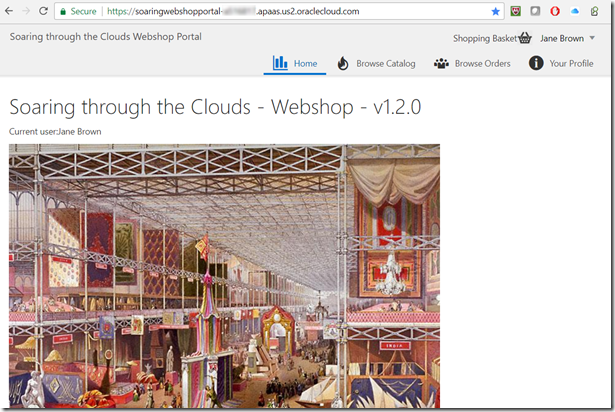 The word Shopping Basket – next to the icon – seems superfluous, I will remove that. And I will increase the version number, from v1.2.0 to v1.2.1. Note: As long the container keeps running, I only have to run “git pull” and “./build-app.sh” for every next update to the JET application. The next step would be to configure a web hook that is triggered by the relevant commit in the GitHub repository. As you can see, after committing and pushing the change, I only had to run a simple command line command to get the application fully rebuilt and redeployed. After stopping the Docker container, no traces remain of the build process. 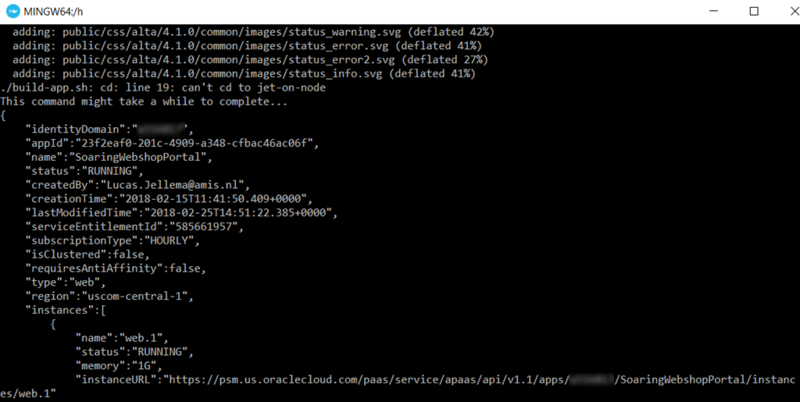 And I can easily share the container image with my team members to build the same application or update to also build other or additional JET applications.